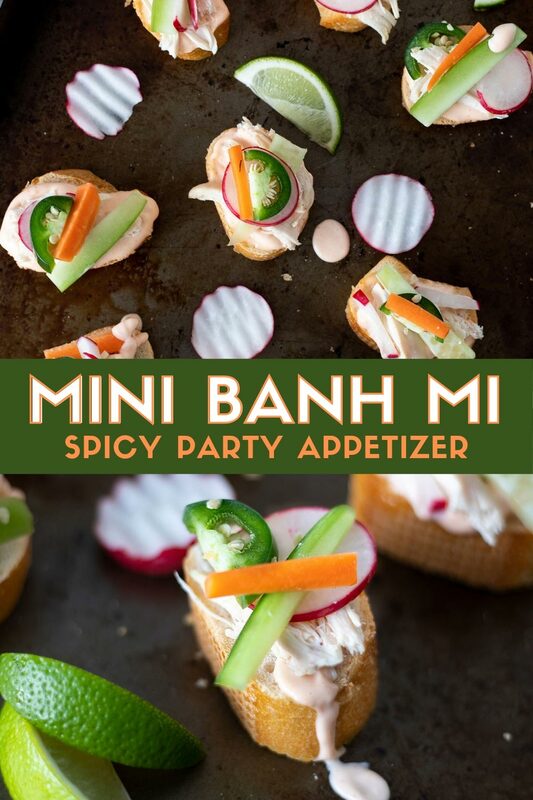 Mini Banh Mi sandwiches are the perfect appetizer for game day or party food. This take on the Veitmenease classic uses a leftover rotisserie chicken to make a spicy finger food. This post contains affiliate links, please see our Site Policies for further information. One of our favorite dinners we make or go out to get is banh mi. If you’re unfamiliar with banh mi, it’s a Vietnamese sandwich stuffed with savory ingredients. Surrounded in a baguette it includes Vietnamese spiced meat, cilantro, pickled vegetables, jalapenos, cabbage, daikon, and mayonnaise. With the big game rolling around this weekend I got to thinking about how I’d love to serve that delicious punch of flavor at my game day party. Yet, making full-size banh mi for a crowd didn’t sound exactly fun on my end. That’s when I came up with the idea to make these Mini Banh Mi. These bite-sized banh mi have all the flavor and kick of a regular sized sandwich with the bonus of being easy to assemble during a pre-game show! 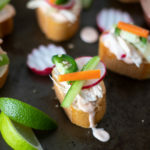 To make these Mini Banh Mi appetizer I used a leftover shredded rotisserie chicken that I spice with classic Vietmenese flavors. You can also use pulled pork as well. Since I couldn’t find mini baguettes I tested to use a thin baguette and top them crostini style. You’ll start by pre-heating an oven to 350 degrees F. Then cut the ends off a thin baguette and followed by cutting it into 16 slices. Add them to a baking tray and brush with olive oil. In a bowl combine shredded chicken, lime juice, ground cardamom (if you’re not a fan, leave it out), ground ginger, ground basil, and salt. Toss until the chicken is completely seasoned. Top each baguette slice with the seasoned chicken. Add it into the oven to toast for 6-7 minutes. While that’s going start chopping your vegetables. You’ll want 16 radish rounds, 16 julienned cucumber slices, and 16 jalapeno half rounds. For the pickled vegetable, I like to make these homemade quick pickled carrots to top the banh mi with. If you are using store-bought pickled carrots, make sure you have 16 thin slices. After your done copping you’ll want to make a spicy mayo if you don’t have any on hand. You can use this Extra Spicy Mayo recipe, a Heath home favorite, just make sure to leave out the Thai Chili if you’d like a more mild spice level. Once the baguette and chicken are out of the oven you can begin assembling. Take creative reign here but this is how I do assemble the banh mi. Extra spicy mayo, radish round, topped with pickled carrot, cucumber slice, and topped with spicy fresh jalapeno. That’s it! That’s all you have to do! You can serve it with extra lime wedges on the side or spicy mayo for further topping. 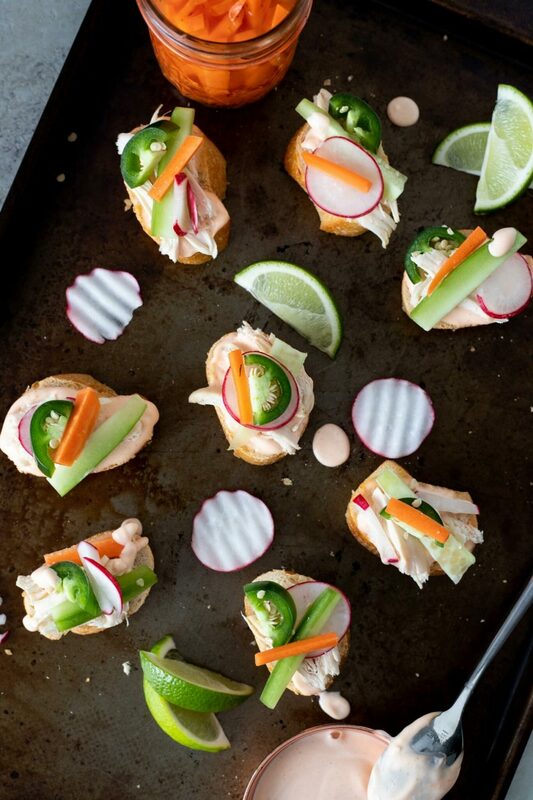 CHECK OUT MORE GAME DAY APPETIZERS! 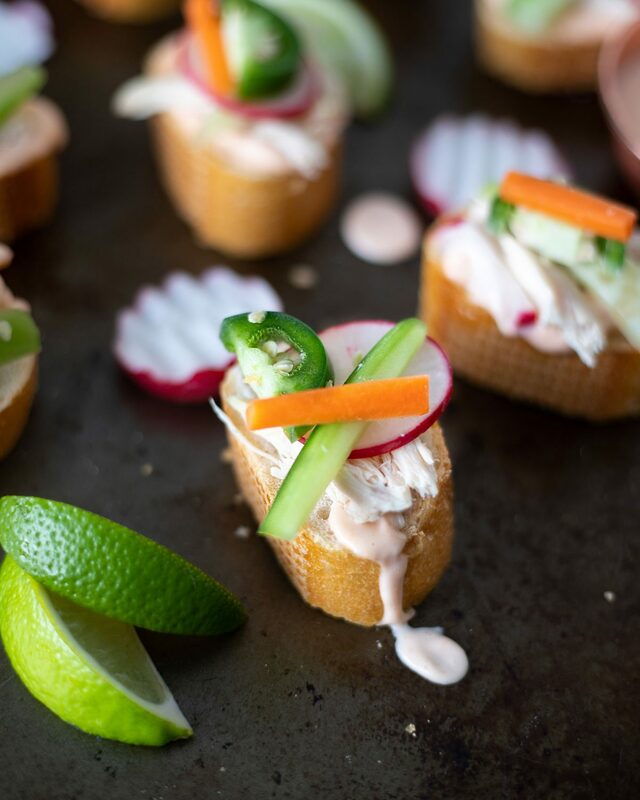 Mini Banh Mi sandwiches are the perfect appetizer for game day or party food. This take on the Veitmenease classic uses leftover rotisserie chicken to make a spicy finger food. In a bowl combine shredded chicken, dried ginger, dried basil, ground cardamom, salt, and lime juice. Combine until well seasoned. Cut the ends off a baguette and then cut it into 16 slices. Arrange on a baking tray. Brush with olive oil and add seasoned chicken to every piece. Add to the oven for 6-7 minutes. Start cutting your vegetables. Slice the radishes into 16 rounds. Peel and julienne the cucumber into 16 pieces. Cut the jalapenos into 8 rounds and then cut them in half again to form 16 crescents. Remove seeds and ribs if you would like the jalapenos less spicy. Once the baguette and chicken have come out of the oven, carefully start assembling the mini banh mi. First, add extra spicy mayo to each toast slice. On top of that stack radish rounds, cucumber slices, pickled carrot, and jalapenos. Serve immediately with extra spicy mayo on the side for dipping and lime wedges for more acid. This easy appetizer is spicy, savory, and acidic. I love how all of these flavors come together to make an appetizer your guest won’t forget. 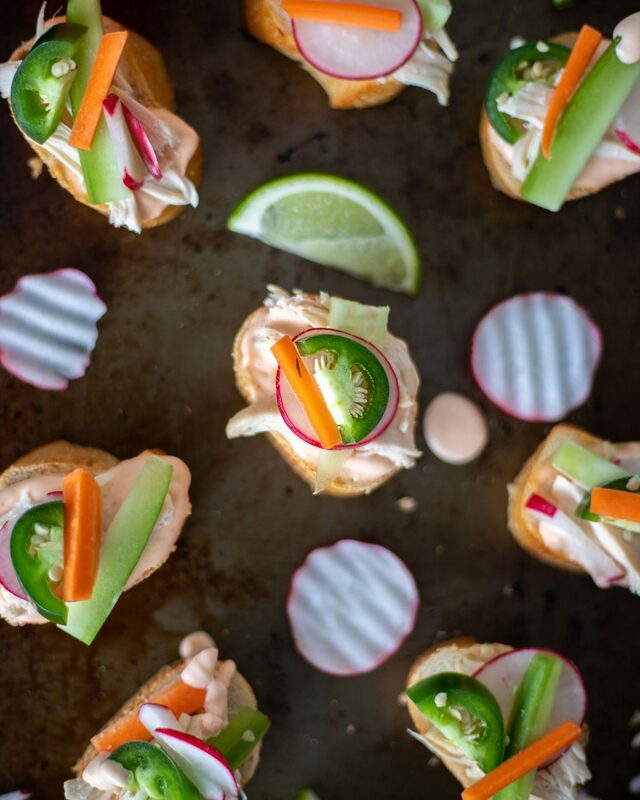 If you’re looking to take your game day hosting a step further, serve these with sake bombs! The beer will tone down the spice but the sake will fit in with the flavors. How are you celebrating the big game this weekend? 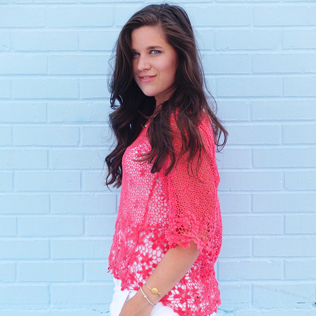 Are you watching for the game, half-time show, or for the commercials? I’m a half-time show kind of watcher! Let me know all your game day details down below! these look AMAZING. they also look like something I could make. 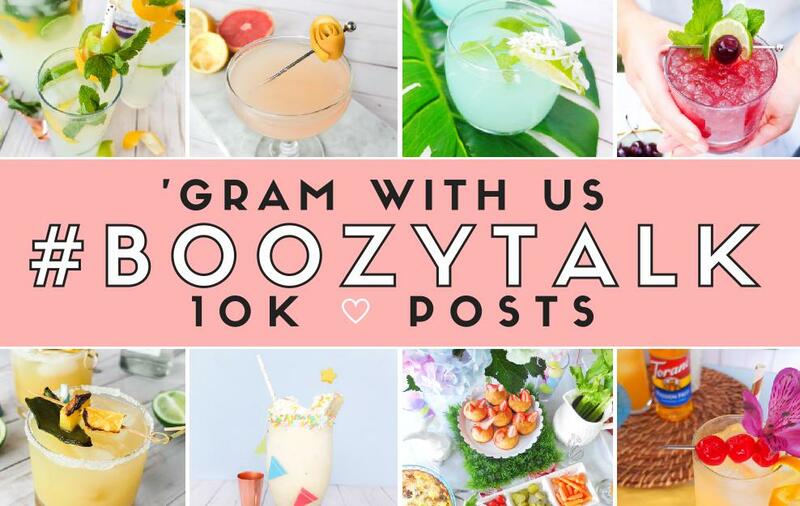 can’t wait to try them out at my next party!